Don't see answers to your questions below? Please go to "Contact Us" and send us a note. Air bed? Won't the claws or nails pop it? I can't blow up the inflatable tube. What's wrong? The tube is leaking. What do I do? What is the correct size for my pet? What is the weight limit for the air beds? Is the canvas washable too? What if my dog/cat likes to scratch? Is the bed (canvas) waterproof? What do you mean "natural nest" or "nesting"? What are the policies on tubes; can I purchase them elsewhere? Of course, no matter how tough our canvas is, nothing is completely "chew proof" -- even small dogs can bite through solid bone and raw hide. If you have a "chewer" the Gertie Gear pet air bed is NOT for you. *NOTE: when pets scratch at their bedding, it's called nesting. 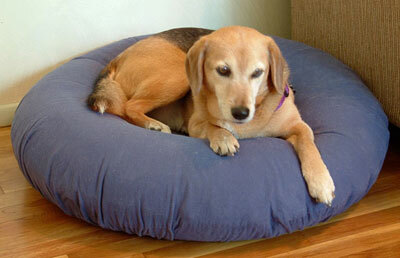 "Gertie" used to scratch (nest) in her old beds, but not in her Gertie Gear pet air bed. See the FAQ about "nesting" to find out why. 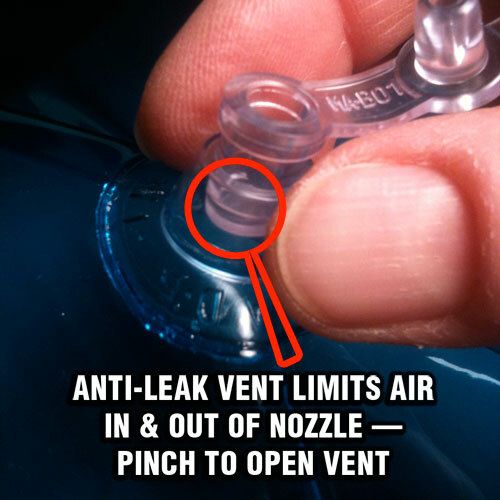 Each tube has an anti-leak feature — pinch valve stem to open when inflating or deflating (see photos). TIP: Under inflate tubes for very light pets to create better “nest” in center OR for older pets just so feet touch ground when walking on it. Over time and with regular use, the inflatable may need to have some air added. 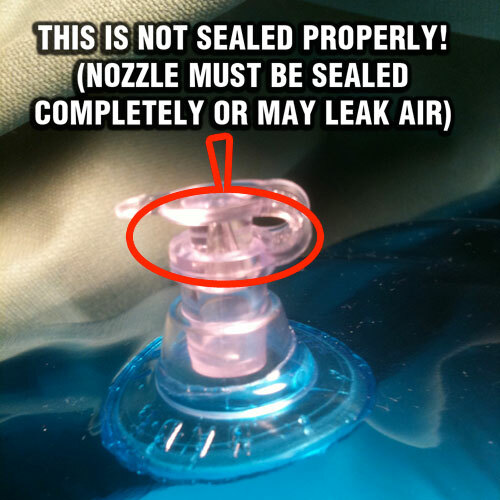 To minimize the need for adding air, please make sure that the nozzle is completely sealed before pressing it into the tube (see photos below); and, do not inflate the tube to it’s maximum capacity. A slightly under inflated tube will still provide all body orthopedic support and comfort, but better adapt to changes in pressure due to air temperature as well as the pressure created when it is used. With proper care and use, a Gertie Gear air bed, including the inflatable portion, will provide support and comfort for years to come -- "Gertie" and her furry siblings have had the same original tubes in their beds since late 2007. Occasionally an inflatable is defective, and unfortunately, we cannot test them all before sale. If an inflatable is defective (has a hole/won’t hold air), it will be apparent almost immediately when the weight of an animal is applied. To receive a replacement tube at the expense of Gertie Gear, you must contact us within 10 days from date of purchase/delivery (as confirmed by shipping company tracking number). After this period, replacement tubes must be purchased. PLEASE NOTE: The force of a human (and/or some heavier animals) falling or jumping on an airbed may compromise the seams of the inflatable. 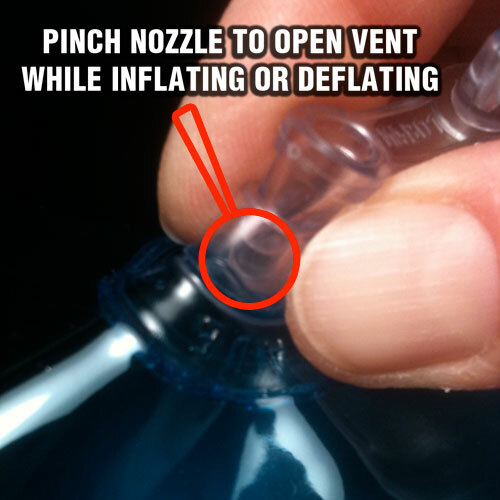 This is considered misuse of the product and does NOT constitute a defective inflatable. The appropriate size bed is not determined by weight, but rather by height, length, and girth of an animal, in comination with how they like to lay on their bed. If you are unsure of which bed size to choose, it's safest to error on the larger size. Since the nesting area and surrounding support is created by the weight of the animal in the center of the bed, a smaller pet will be just as comfortable in a larger bed, but if the bed is too small for the pet, they may not enjoy it as much. PLEASE NOTE: Style, color and graphics printed on tube may vary depending upon supplier availability. 30” and 36” tubes are made of 8 gauge (or thicker) vinyl. 46” tubes are 12 gauge (or thicker) vinyl. The appropriate size bed is not determined by weight. Essentially, if a pet can lie comfortably on one of the beds, the animal's weight is not an issue and will not damage the inflatable. Think of the inflatable as simply a replacement for stuffing -- it doesn't really hold the weight of an animal. The weight is supported by the strength of the canvas that is wrapped around the inflatable tube. 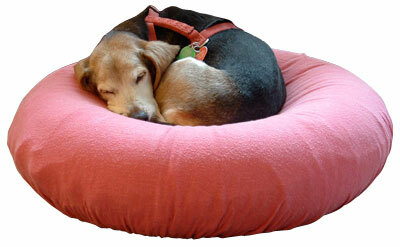 The smallest bed of 30" diameter can hold any size animal that can fit on it. The same is true of the 36" and 46" beds. Do not jump on the air bed -- it is not a toy nor trampoline. YES, actually the canvas has been pre-washed and dried on hot settings to pre-shrink it before cutting and assembly. This extra step ensures that the canvas will maintain it's proper size and shape when washed regularly. We recommend machine washing the canvas in warm water using your favorite non-bleach detergent. Since the zipper does not have any sharp edges, it is safe and appropriate to launder with blue jeans or other heavier fabrics. Feel free to tumble dry the canvas undercover on low-med heat as well or air dry if you prefer. Scratching (dog nails nor cat claws) cannot penetrate the canvas undercover which protects the inflatable. When pets scratch at their bedding it's called "nesting." 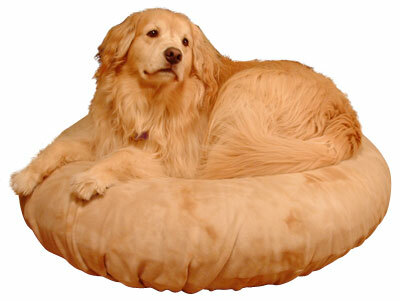 When a dog/cat sits in a Gertie Gear pet air bed, the weight of the animal forms a "natural nest" which conforms perfectly to the shape of the animal's body. "Gertie" used to "nest" in her old beds and she STILL scratches a lot when she sits on a blanket or towel. But now, that her Gertie Gear air bed makes the nest for her, she no longer scratches her bed -- she walks in, turns around a few times, realizes "it's perfect", then lies down. Presto!... no more scratching. Of course we cannot guarantee that all pets will cease scratching completely, but we've witnessed at least a decrease even in the most avid scratchers. Additionally, dog nails often have smoother edges and are thicker that cat claws. In such a case, even if a dog does scratch the slipcover, it's doubtful that he/she will tear the fabric. However, if your dog and especially a cat with front claws, loves to scratch, we recommend a slipcover fabric which takes a beating and/or does not fray. For example, fleece is a resilient fabric. It stretches and its edges do not fray, even when torn. On the contrary, if a silky fabric gets snagged, like on a needle-like cat claw, its edges will fray like crazy, and most likely start to unravel when washed. If you have a cat that likes to scratch, DO NOT get a silky slipcover. Try a fleece or denim that will better hold up to the abuse. NO, the canvas is "water/moisture resistent" but not completely "water proof." The canvas we have been using, is made of a cotton-polyester blend, tightly woven for stregnth and durability. It is some of the strongest canvas that the commercial marine industry has to offer. We are currently transitioning to a 100% nylon canvas which is lighter, yet stronger and even more water resistent, but still not quite water"proof". If you're pet is incontinent or a heavy slobberer, try slipping a pee pad between the slipcover and the canvas undercover. When it's sandwiched between the covers, your pet can't push it out of the way and it can reduce the frequency of the need to wash the canvas. When pets scratch at their bedding it's called "nesting." The goal is to "fluff" the material in order to create a comfortable area that surrounds and supports their body, and often for warmth as well. It's similar to how people fluff their pilllow, curl up in a blanket or use a body pillow for support. When a dog/cat sits in a Gertie Gear pet air bed, the weight of the animal presses down on the canvas which is supported by the inflatable tube, and therefore acts much like a hamoc. Their weight forms a "natural nest" which conforms perfectly to the shape of the animal's body. "Gertie" still scratches like crazy when she sits on a blanket or towel, and she used to "nest" in her old beds. Now that her Gertie Gear bed makes the nest for her, she no longer scratches her bed -- she walks in, turns around a couple of times, realizes "it's perfect", then lies down. Presto!... no more scratching. 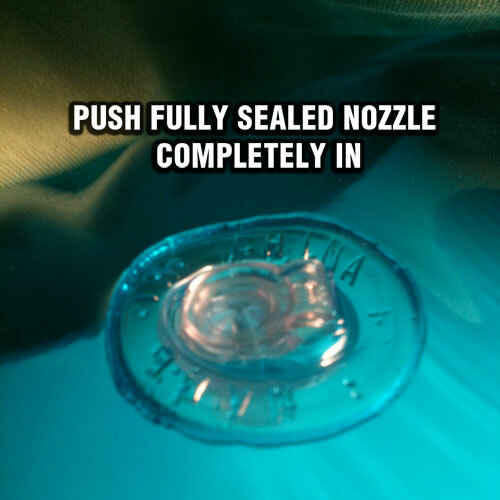 Opened tubes, as with any item which MAY contact bodily fluids, cannot be resold as new; this is why opened tubes are not exchangeable or returnable. As per the tube insert shipped inside each tube package, all 46” tubes are now TESTED before they are shipped, to verify they are NOT defective. 46” tubes have been tested with as much as 90 lbs or more for several consecutive days, and they have held air without issue. We have even taken them to all-day concert venues and used them as an alternative to blankets for the “lawn” seats (of course this is NOT recommended, or considered “proper use”). 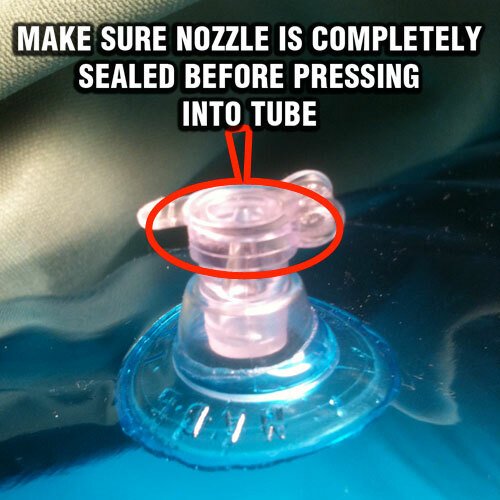 Very few customers have needed to order replacement tubes, but generally do so after more than a year of regular use, or after misuse or improper care. Improper use/care includes but is not limited to: falling/jumping on the air beds; excessive weight (use by more than a single pet at one time — pet must fit comfortably on the air bed, without more than it’s head hanging over when in curled/nesting position); applying weight/pressure when the inflatable is not encase completely inside the fully zipped-closed canvas cover; scratching, snagging, or other damage incurred when tube is not being protected inside canvas cover; improperly closed/sealed nozzles (see FAQs for tips on leaking beds); over inflation (instructions state that the tubes should be slightly under inflated — soft/squishy), etc. Unfortunately, it is not possible to know what occurs which could damage the inflatable when the beds (and pets) are out of sight. This is why we TEST ALL 46” tubes — to verify that with regular use, exclusively as a bed, the tubes function properly. 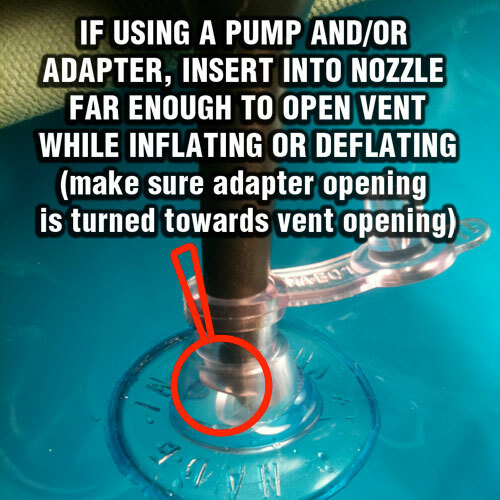 If a seam/nozzle/vinyl wall is defective or has a hole/puncture prior to testing, it will be apparent during the test, and will deflate. Gertie Gear has no contribution or influence in the manufacturing of the inflatable tubes. Tubes are offered through GertieGear.com as a convenience, and potential savings on s/h for our customers. Gertie Gear DOES NOT warranty the 46” (TESTED) tubes, and only offers (TESTED) replacements for defective 30” and/or 36” tubes. We have found that some resellers/distributors of tubes refer customers directly to the manufacturer for refund/replacements as well. Gertie Gear incurs little or no profit from the resale of the inflatable tubes and encourages customers to acquire them from other sources which may offer more liberal return/exchange policies, including s/h reimbursement. Tubes may only be returned/exchanged if their plastic packaging is UNOPENED. PLEASE NOTE: 46” tubes are approximately 3 lbs each and may cost more to return ship than the fees/cost of keeping the tube and using it for it’s originally intended purpose (river raft, pool float, etc). NOTE: retailers/manufactures describe the tubes used for the 46” pet air beds as 47” or 48”, but they measure closer to 46” when inflated. During warmer seasons, tubes can be found at many major retail stores, including TARGET, K-mart, Wallgreens, etc. PLEASE NOTE: Gertie Gear consciously chooses to offer pet air beds in sizes 30”, 36” and 46”; these are standard size tubes which can be economically replaced and easily found online or at a local store. Gertie Gear has only the best intentions in creating products that offer durability/quality, while minimize our eco-footprint. We designed our pet air beds with interchangeable components so that customers would not have to purchase a completely new air bed set and dispose of still functional components which would then end up in landfills.